The most groundbreaking event in Aspen Comics' history collected!!! For over thirteen years, devoted Aspen Comics fans clamored for something special...something unique...something...UNIMAGINABLE! 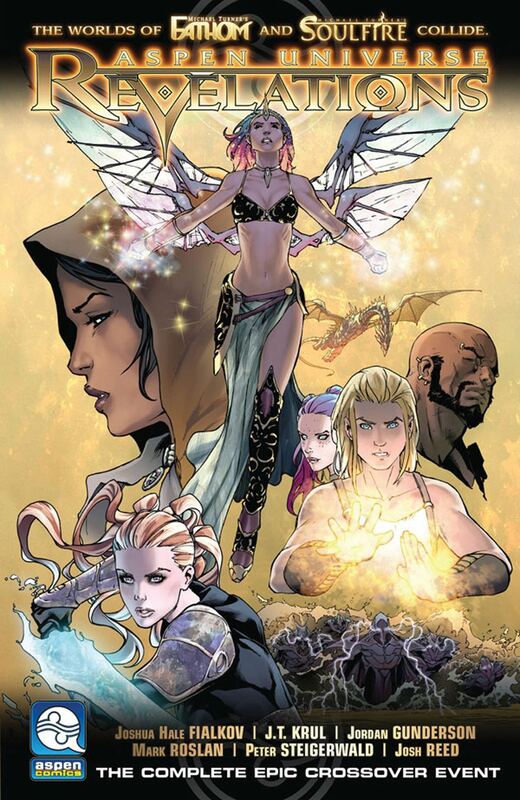 Aspen Comics answered the call for loyal fans and new readers alike with ASPEN UNIVERSE: REVELATIONS. Legendary creator Michael Turner's two greatest creations, FATHOM and SOULFIRE, united for the first time as one in this crossover story so massive in scope, it forged a BRAND NEW ASPEN UNIVERSE in the process! A magical being of unimaginable might has destroyed the world as they knew it, and it remains up to Soulfire's magical bearer of the light, Malikai, along with Fathom's preeminent heroine, Aspen Matthews, to try and restore order and peace to a world decimated by the malevolent power of dark magic! From the mind of Harvey, Eisner and Emmy Award nominated writer Joshua Hale Fialkov and New York Times Best-Selling author J.T. Krul, along with the amazing art abilities of Jordan Gunderson and Peter Steigerwald, comes this world-shattering crossover series event that set the stage for all future Aspen Comics titles to come!